Although the Town of Maine Cemetery was officially chartered in 1858, the site had been used as a burial ground for at least four decades earlier. 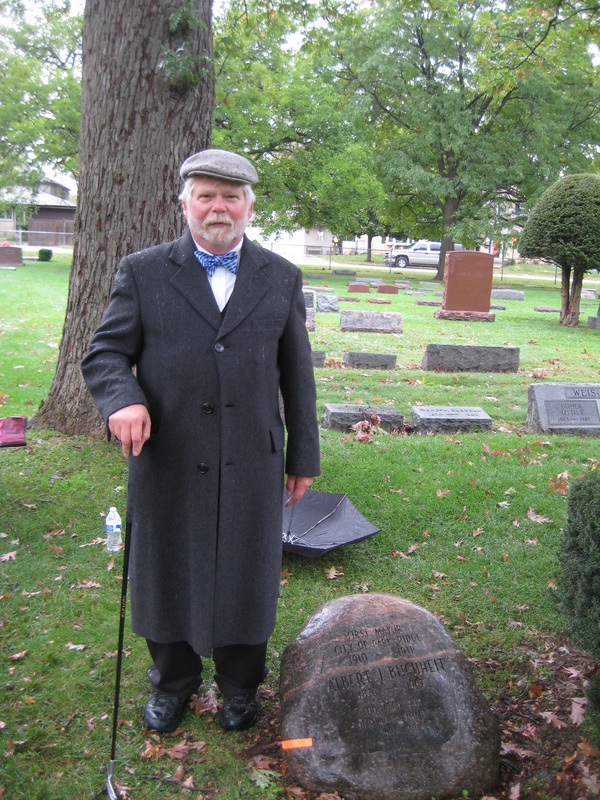 In fact, the oldest headstone (James Watts) is dated 1811, which precedes the incorporation of the State of Illinois. This is the second oldest cemetery in Cook County. Some of the pioneers who settled this area are buried in the Cemetery, including several whose names were lent to familiar roads such as Ballard, Higgins, Lee, Miner, Rand and Talcott. A large monument marks the 32 graves of George Penny and his family. Penny founded a local brickyard with Robert Meacham in 1853. The adjoining village was called Pennyville and renamed Brickton in 1858. It became Park Ridge in 1873. Penny and Meacham bought the first five acres of land for the Cemetery in what is now the northwest corner of the property. That is where the oldest headstones are found, including the Meacham family plot. Many of the names reflect the influx of German and Scandinavian immigrants who came to Des Plaines, Park Ridge and Maine Township a century ago. Six Park Ridge and four Des Plaines village presidents/mayors are interred in the Cemetery. Other notables buried here include Dr. Frederick Noyes, Dean of the University of Illinois College of Dentistry, and Bob Hale, Major League baseball player. Early merchants are represented here, as well, such as the Lagerhausen, Moheiser and Scharringhausen families. A large memorial dedicated to the Grand Army of the Republic is capped by a Civil War soldier and surrounded by nearly a dozen veterans of that conflict. Spanish-American War veterans are buried around the circle, too. Many other veterans are laid to rest throughout the Cemetery, including at least one member of the Royal Canadian Air Force. The distinctive Gate House, which serves as the Cemetery office, is a historic landmark (ca. 1915). According to local lore, the chapel-like structure was designed, in part, by Alfonso Iannelli, a famous artist, sculptor and industrial designer. Among his works are the interior of the Pickwick Theater (Park Ridge), the signs of the Zodiac around the Adler Planetarium and the Rock of Gibraltar relief on the façade of the Prudential Building in Chicago. Iannelli lived and worked in Park Ridge. He is buried in the Cemetery. The 100th Anniversary of the Gate House is being celebrated in 2015. An Open House is planned for the early Fall to give visitors a close-up look at the building, currently undergoing restoration and renovation. “The Spirits of Old Park Ridge” is a popular program sponsored by the Park Ridge Historical Society. Local actors, including students from the Maine South High School Drama Department, portray some of the historical figures that are laid to rest in the Town of Maine Cemetery. Guided tours around the grounds provide visitors with a walk through Time; and the actors, wearing period costumes, bring their characters back to life. The “Spirits” programs are usually presented on a Saturday in early October. Park Ridge, during the 2014 “Spirits of Old Park Ridge” program. © 2014 Copyright by Town of Maine Cemetery. All rights reserved.